Did you know that pollinators make mangoes? Mangoes are an important fruit crop in many different parts of East Africa. Mangoes are a delicious fruit that are healthy and nutritious and especially rich in Vitamin C, Vitamin A and rich in dietary fibre, which are all important for healthy growth and diets. A single ripe mango can supply up to 76% of the daily requirement of Vitamin C and 25 % of the daily requirement of Vitamin A. 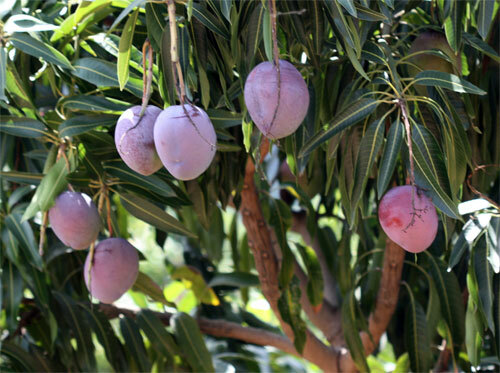 A single healthy mango tree can produce thousands of nutritious, saleable fruits over a year. Mango trees supply fruit seasonally and are also the basis of an important industry for mango juice and dried fruit. Mango trees flower in synchrony and bear many flowers on flowering branches all over the tree. Mango trees are highly dependent on pollinators. Mango flower (right) and young freshly pollinated fruit forming (left). 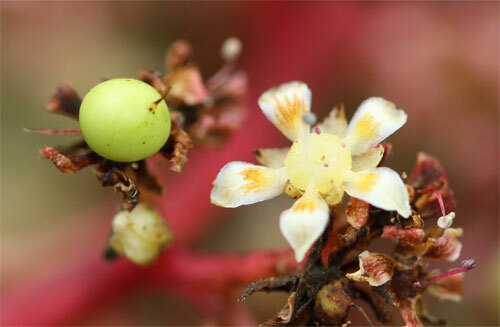 The mango flowers are simple, open and small in size. They are visited and pollinated by many different kinds of insects. 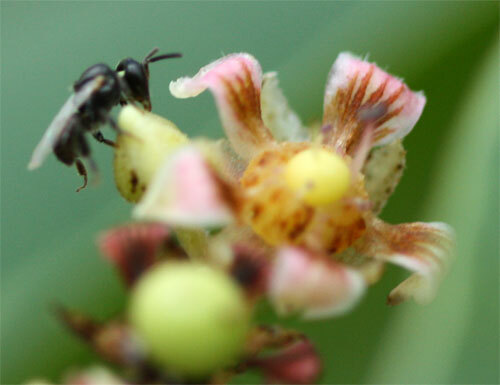 Mango pollinators include different kinds of wasps, flies, stingless bees and even ants. 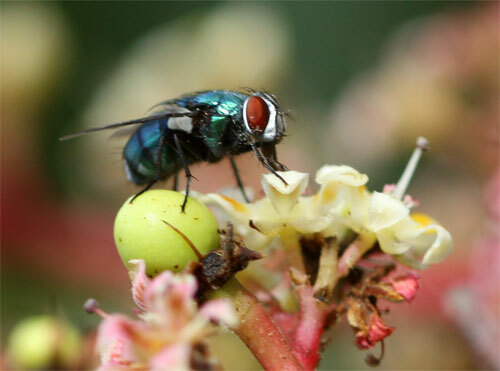 Flies and stingless bees are thought to be the main pollinators of mangoes as they visit the flowers in large numbers and disperse between different trees. 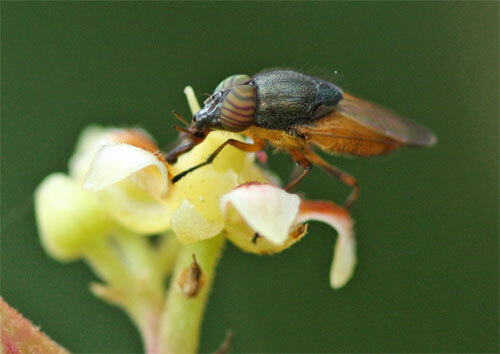 As mango pollinators are wild insects, the main things that support them are patches of natural habitat and wildflowers to visit when the mango trees are not in flower. 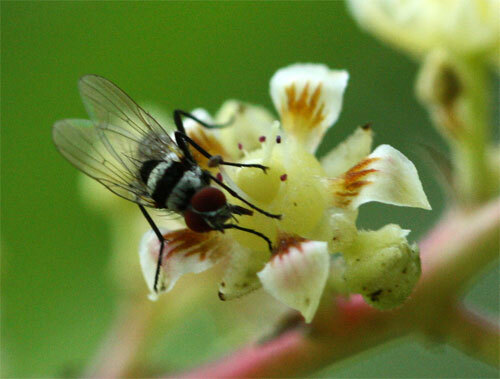 Farmers growing mangoes need to be aware of the importance of pollinators for mango production. 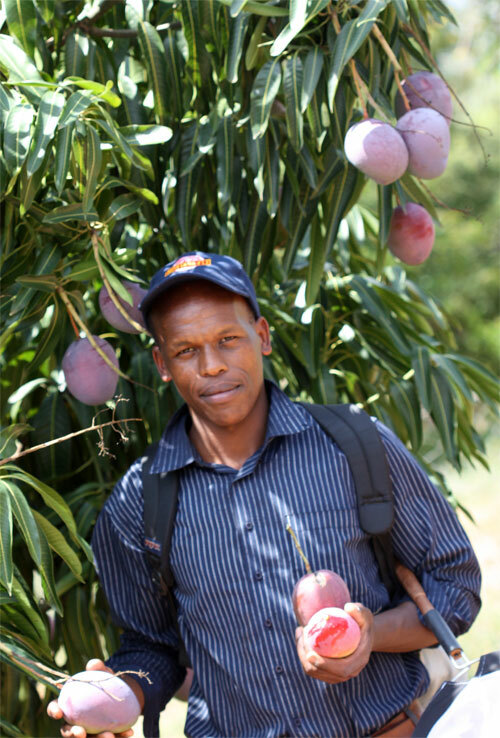 On one farm in the Kerio Valley, we estimated that a healthy mango tree can yield up to 1000 mangoes over a year. Each mango sells for 40-50 KShs (about 0.5 $). This means that wild pollinating insects are responsible for producing mangoes worth 40,000 – 50,000 KShs (around 500 US $) per tree per year. This is just one example of how pollinators contribute to our food security and economy. Remember! No Pollinators = No Mangoes!